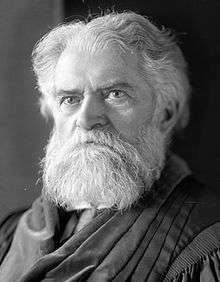 Simon Newcomb (March 12, 1835 – July 11, 1909) was a Canadian-American astronomer, applied mathematician and autodidactic polymath, who was Professor of Mathematics in the U.S. Navy and at Johns Hopkins. Though he had little conventional schooling, he made important contributions to timekeeping as well as other fields in applied mathematics such as economics and statistics in addition to writing a science fiction novel. Simon Newcomb was born in the town of Wallace, Nova Scotia. His parents were Emily Prince, the daughter of a New Brunswick magistrate, and itinerant school teacher John Burton Newcomb. John moved around teaching in different parts of Canada, particularly in different villages in Nova Scotia and Prince Edward Island. Emily was a daughter of Thomas Prince and Miriam Steeves, making Simon a great-great-grandson of Heinrich Stief, and a not-too-distant cousin of William Henry Steeves, a Canadian Father of Confederation. Newcomb seems to have had little conventional schooling other than from his father and from a short apprenticeship to Dr. Foshay, a charlatan herbalist, in New Brunswick in 1851. Nevertheless, his father provided him with an excellent foundation for his future studies. Newcomb's apprenticeship with Dr. Foshay occurred when he was only 16. They entered an agreement that Newcomb would serve a five-year apprenticeship during which time Foshay would train him in using herbs to treat illnesses. For two years he was an apprentice but became increasingly unhappy and disillusioned with his apprenticeship and about Foshay's unscientific approach, realizing that the man was a charlatan. He made the decision to walk out on Foshay and break their agreement. He walked the 120 miles (190 km) to the port of Calais in Maine where he met the captain of a ship who agreed to take him to Salem, Massachusetts so that he could join his father. In about 1854, he joined his father in Salem (John Newcomb had moved earlier to the United States), and the two journeyed together to Maryland. After arriving in Maryland, Newcomb taught for two years from 1854 to 1856; for the first year in a country school in Massey's Cross Roads, Kent County, MD, then for a year at a school not far south in Sudlersville in Queen Anne's County, MD. In his spare time he studied a variety of subjects such as political economy and religion, but his deepest studies were made in mathematics and astronomy. In particular he read Newton's Principia at this time. In 1856 he took up a position as a private tutor close to Washington and he often travelled to that city to study mathematics in the libraries there. He was able to borrow a copy of Bowditch's translation of Laplace's Traité de mécanique céleste from the library of the Smithsonian Institution but found the mathematics beyond him. Newcomb studied mathematics and physics privately and supported himself by teaching before becoming a human computer (a functionary in charge of calculations) at the Nautical Almanac Office in Cambridge, Massachusetts in 1857. At around the same time, he enrolled at the Lawrence Scientific School of Harvard University, graduating BSc in 1858. Newcomb studied mathematics under Benjamin Peirce and the impecunious Newcomb was often a welcome guest at the Peirce home. However, he later was said to develop a dislike of Peirce's son, Charles Sanders Peirce and has been accused of a "successful destruction" of C. S. Peirce's career. In particular, Daniel Coit Gilman, president of Johns Hopkins University, is alleged to have been on the point of awarding tenure to C. S. Peirce, before Newcomb intervened behind the scenes to dissuade him. About 20 years later, Newcomb allegedly influenced the Carnegie Institution Trustees, to prevent C. S. Peirce's last chance to publish his life's work, through a denial of a Carnegie grant to Peirce, even though Andrew Carnegie himself, Theodore Roosevelt, William James and others, wrote to support it. In the prelude to the American Civil War, many US Navy staff of Confederate sympathies left the service and, in 1861, Newcomb took advantage of one of the ensuing vacancies to become professor of mathematics and astronomer at the United States Naval Observatory, Washington D.C.. Newcomb set to work on the measurement of the position of the planets as an aid to navigation, becoming increasingly interested in theories of planetary motion. By the time Newcomb visited Paris, France in 1870, he was already aware that the table of lunar positions calculated by Peter Andreas Hansen was in error. While in Paris, he realised that, in addition to the data from 1750 to 1838 that Hansen had used, there was further data stretching as far back as 1672. His visit allowed little serenity for analysis as he witnessed the defeat of French emperor Napoleon III in the Franco-Prussian War and the coup that ended the Second French Empire. Newcomb managed to escape from the city during the ensuing rioting that led up to the formation of the Paris Commune and which engulfed the Paris Observatory. Newcomb was able to use the "new" data to revise Hansen's tables. He was offered the post of director of the Harvard College Observatory in 1875 but declined, having by now settled that his interests lay in mathematics rather than observation. In 1877 he became director of the Nautical Almanac Office where, ably assisted by George William Hill, he embarked on a program of recalculation of all the major astronomical constants. Despite fulfilling a further demanding role as professor of mathematics and astronomy at Johns Hopkins University from 1884, he conceived with A. M. W. Downing a plan to resolve much international confusion on the subject. By the time he attended a standardisation conference in Paris, France, in May 1896, the international consensus was that all ephemerides should be based on Newcomb's calculations—Newcomb's Tables of the Sun. A further conference as late as 1950 confirmed Newcomb's constants as the international standard. Newcomb was married to Mary Caroline Hassler and had at least two daughters with her. Mary Caroline Hassler's father was United States Navy Surgeon Dr. Charles Augustus Hassler and her grandfather was Ferdinand Hassler, the first Superintendent of the Coast Survey. 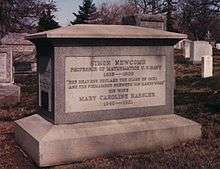 Newcomb died in Washington, DC of bladder cancer and was buried with military honors in Arlington National Cemetery with President William Howard Taft in attendance. Newcomb's daughter Anita Newcomb McGee was an MD and founder of the Army Nurse Corps. She received the Spanish War Service Medal for her services during the Spanish–American War. For her work in Japan she was awarded the Japanese Imperial Order of the Precious Crown, The Japanese Red Cross decoration and two Russo-Japanese War medals from the Japanese government. She is buried next to him with full military honors. Newcomb's daughter Anna Josepha studied at the Art Students' League in New York. She was active in the suffrage movement. In 1912, she organized the first Cornwall meeting in support of voting rights for women. Josepha Newcomb married Assistant US Attorney General Edward Baldwin Whitney, who was the son of Professor William Dwight Whitney and the grandson of US Senator and Connecticut Governor Roger Sherman Baldwin. He was also the grandfather of mathematician and Professor Hassler Whitney. In 1878, Newcomb had started planning for a new and precise measurement of the speed of light that was needed to account for exact values of many astronomical constants. He had already started developing a refinement of the method of Léon Foucault when he received a letter from the young naval officer and physicist Albert Abraham Michelson who was also planning such a measurement. Thus began a long collaboration and friendship. In 1880, Michelson assisted at Newcomb's initial measurement with instruments located at Fort Myer and the United States Naval Observatory, then situated on the Potomac River. However, Michelson had left to start his own project by the time of the second set of measurements between the observatory and the Washington Monument. Though Michelson published his first measurement in 1880, Newcomb's measurement was substantially different. In 1883, Michelson revised his measurement to a value closer to Newcomb's. In 1881, Newcomb discovered the statistical principle now known as Benford's law, when he observed that the earlier pages of logarithm books, used at that time to carry out logarithmic calculations, were far more worn than the later pages. This led him to formulate the principle that, in any list of numbers taken from an arbitrary set of data, more numbers will tend to begin with "1" than with any other digit. In 1891, within months of Seth Carlo Chandler's discovery of the 14-month variation of latitude, now referred to as the Chandler wobble, Newcomb explained the apparent conflict between the observed motion and predicted period of the wobble. The theory was based on a perfectly rigid body, but Earth is slightly elastic. Newcomb used the variation of latitude observations to estimate the elasticity of Earth, finding it to be slightly more rigid than steel. Newcomb was an autodidact and polymath. He wrote on economics and his Principles of political economy (1885) was described by John Maynard Keynes as "one of those original works which a fresh scientific mind, not perverted by having read too much of the orthodox stuff, is able to produce from time to time in a half-formed subject like economics." He was credited by Irving Fisher with the first-known enunciation of the equation of exchange between money and goods used in the quantity theory of money. He spoke French, German, Italian and Swedish; was an active mountaineer; widely read; and authored a number of popular science books and a science fiction novel, His Wisdom the Defender (1900). In 1888 Simon Newcomb wrote: "We are probably nearing the limit of all we can know about astronomy." By 1903, however, his view had changed. In an article in Science he wrote: "What lies before us is an illimitable field, the existence of which was scarcely suspected ten years ago, the exploration of which may well absorb the activities of our physical laboratories, and of the great mass of our astronomical observers and investigators for as many generations as were required to bring electrical science to its present state." Newcomb is famously quoted as having believed it impossible to build a "flying machine". He begins an article titled "Is the Airship Possible?" with the remark, "That depends, first of all, on whether we are to make the requisite scientific discoveries." He ends with the remark "the construction of an aerial vehicle ... which could carry even a single man from place-to-place at pleasure requires the discovery of some new metal or some new force." In the October 22, 1903, issue of The Independent, Newcomb made the well-known remark that "May not our mechanicians . . . be ultimately forced to admit that aerial flight is one of the great class of problems with which man can never cope, and give up all attempts to grapple with it? ", completed by the motivation that even if a man flew he could not stop. "Once he slackens his speed, down he begins to fall. Once he stops, he falls as a dead mass." He had no concept of an airfoil. His "aeroplane" was an inclined "thin flat board". He therefore concluded that it could never carry the weight of a man. Newcomb was specifically critical of the work of Samuel Pierpont Langley, who claimed that he could build a flying machine powered by a steam engine and whose initial efforts at flight were public failures. In 1903, however, Newcomb was also saying, "Quite likely the 20th century is destined to see the natural forces which will enable us to fly from continent to continent with a speed far exceeding that of a bird. But when we inquire whether aerial flight is possible in the present state of our knowledge; whether, with such materials as we possess, a combination of steel, cloth and wire can be made which, moved by the power of electricity or steam, shall form a successful flying machine, the outlook may be altogether different." Newcomb was clearly unaware of the Wright Brothers' efforts whose work was done in relative obscurity and apparently unaware of the internal combustion engine's better power-to-weight ratio. When he heard about the Wrights' flight in 1908 he was quick to accept it. Newcomb favored the development of rotating wing (helicopters) and airships that would float in the air (blimps). Within a few decades, Zeppelins regularly transported passengers between Europe and the United States, and the Graf Zeppelin circumnavigated the Earth. Elected a member of the Royal Swedish Academy of Sciences (1875);. Founding member and first president of the American Astronomical Society (1899–1905). Inductee of the Hall of Fame for Great Americans. Asteroid 855 Newcombia is named after him. The crater Newcomb on the Moon is named after him. The Royal Astronomical Society of Canada has a writing award named after him. Newcomb, S (1881). "Note on the frequency of use of the different digits in natural numbers". American Journal of Mathematics. 4 (1): 39–40. doi:10.2307/2369148. JSTOR 2369148. A number of astronomical, physical, and mathematical papers written between 1882 and 1912 are mentioned in "Astronomical Papers Prepared For The Use Of The American Ephemeris And Nautical Almanac". U.S. Naval Observatory. The Nautical Almanac Office. 2008-08-12. Retrieved 2009-02-24. ↑ "Mary Caroline Hassler Newcomb ( - 1921) - Find A Grave Memorial". www.findagrave.com. Retrieved 2016-09-30. ↑ "Dr Charles Augustus Hassler (1810 - 1846) - Find A Grave Memorial". www.findagrave.com. Retrieved 2016-09-30. ↑ "National Museum of Health and Medicine (NMHM): American Angels of Mercy: Dr. Anita Newcomb McGee's Pictorial Record of the Russo-Japanese War, 1904: Dr. Anita Newcomb McGee, 1864-1940". www.medicalmuseum.mil. Retrieved 2016-09-30. 1 2 "Josepha Newcomb Whitney". cornwallhistoricalsociety.org. Retrieved 2016-09-30. ↑ Chern, Shiing-Shen (September 1994). "Hassler Whitney (23 March 1907-10 May 1989)". Proceedings of the American Philosophical Society. 138 (3): 464–467. JSTOR 986754. ↑ Newcomb, S. (January 23, 1903), "The Universe as an Organism", Science, (N.S. ), 17 (421): 121–129, Bibcode:1903Sci....17..121N, doi:10.1126/science.17.421.121, JSTOR 1631452 . The quote is in the final paragraph, on p. 129. ↑ Newcomb, Simon (September 1901). "Is the Airship Coming?". McClure's magazine. S. S. McClure, Limited. 17 (5): 432–435. ↑ "The Outlook for the Flying Machine". The Independent. 55 (2864): 2509. October 22, 1903. Retrieved 26 April 2015. ↑ Albert E. Moyer (1992). A scientist's voice in American culture: Simon Newcomb and the rhetoric of scientific method. University of California Press. p. 187. ↑ "What Did Newcomb Say?". The Independent. New York: Independent Corporation. 103 (3738): 374. September 25, 1920. ↑ Anita Newcomb McGee (Apr 20, 1919). "Simon Newcomb on Flying. He did not take the gasoline engine into account in his writings". New York Times. Retrieved 2011-01-25. ↑ "Simon Newcomb (1835 - 1909)". Royal Netherlands Academy of Arts and Sciences. Retrieved 26 July 2015. Brent, J. (1993). Charles Sanders Peirce: A Life. Bloomington: Indiana University Press. ISBN 0-253-31267-1. Carter, W. & Carter M. S. (2005). Simon Newcomb, America's Unofficial Astronomer Royal. St. Augustine: Mantanzas Publishing. ISBN 1-59113-803-5. Fisher, Irving (1909). "Obituary. Simon Newcomb" Economic Journal, 19, pp. 641–44. Marsden, B. (1981) "Newcomb, Simon" in Gillespie, C.C., ed. (1981). Dictionary of Scientific Biography. 10. New York: Charles Screibner's Sons. pp. 33–36. ISBN 0-684-16970-3. Wikimedia Commons has media related to Simon Newcomb. O'Connor, John J.; Robertson, Edmund F., "Simon Newcomb", MacTutor History of Mathematics archive, University of St Andrews .